a diffusible substance produced by endothelial cells that cause vascular smooth muscle relaxation; nitric oxide (NO). A multifaceted bioregulatory agent and environmental pollutant capable of causing genotoxicity. A gas byproduct of high-temperature combustion (e.g., internal combustion engines) which, on exposure to light, results in nitrous oxide (N2O) formation, an irritating air pollutant and major greenhouse gas. A neurotransmitter released when glutamate binds to the NMDA receptor, which is critical in regulating vascular tone. Diffusible substance produced by endothelial cells that cause vascular smooth muscle relaxation; nitric oxide (NO). A substance such as nitric oxide produced by the lining cells of arteries that acts on the circularly placed smooth muscle in the walls of arteries to relax it and so promote widening (vasodilatation). Its action lasts for only a few seconds. Diffusible substance produced by endothelial cells that causes vascular smooth muscle relaxation; nitric oxide (NO). substances produced by or released from endothelial cells which regulate vascular smooth muscle or other regulatory mechanism; include prostacyclin and other prostanoids, angiotensin, and relaxing or constricting factors. vasoconstrictive peptides isolated from vascular endothelial cells which are actively vasoconstrictive; endothelin (ET) is the most active of them. several are known; nitrous oxide is one of the chief mediators, probably derived from l-arginine. Based on the fact that vascular effect in isolated aortic rings is possibly mediated by endothelium-derived relaxing factors, we hypothesize that NO may also mediate local cardiac effects of OEMV. Vascular endothelium regulates the underlying smooth muscle layer and vascular tone by release of endothelium-derived relaxing factors such as nitric oxide (NO), prostaglandins, and endothelium-derived hyperpolarizing factor (EDHF) as well as vasoconstricting factors such as endothelin, superoxide (O2-), and thromboxane (25, 28-32). These effects are counterbalanced by the pulmonary vascular endothelium's ability to release endothelium-derived relaxing factors (56), which includes nitric oxide (NO) (57,58) and prostacyclin (59). 2), suggesting the participation of endothelium-derived relaxing factors (EDRF) such as nitric oxide (NO) and prostacyclin ([PGI. 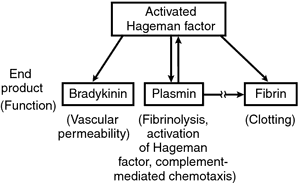 1A), indicating that the vasodilator effect of EEF is dependent on endothelium-derived relaxing factors.